"Complete solution for audio edition, recording and conversion"
GoldWave is a popular and professional digital audio editing tool that includes every possible function you could want from an audio editor. 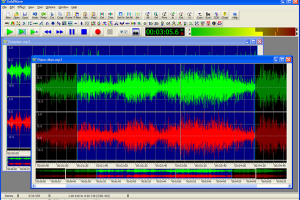 You can use this program to do about anything you want related to digital audio. From the most basics, like playing your favorites songs, to more advanced things like analyzing audio with frequency and amplitude visuals using spectrograms, waveforms, and other useful graphs, or remastering old vinyl and tape recordings. GoldWave, although displaying an old-looking interface, can do about everything you need. In features many real-time graphs, including waveform, spectrogram, spectrum and VU meter, as well as filters and effects, like noise reduction, volume shaping, pitch, resampling and more, and it allows to 'preview' these effects. It supports DirectX Audio plug-in, as well as batch processing for a wide number of formats, including WAV, MP3, Ogg, AIFF and many more. This program will definitely exceed your expectations.